Burns Llama Trailblazers provides training, mentoring and support at all times. It is our mission to help people and llamas work together to their best capacity. We also provide backcountry services listed below as our access to permits and insurance coverage allows. Please contact us for current details. 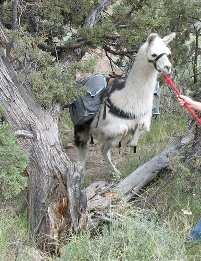 Our training trips teach the basics of traveling with llamas in the backcountry. Hands on demonstrations show you necessary llama handling techniques and we discuss and demonstrate outdoor safety and travel skills. These trips are designed to teach you how to work with and care for your pack llama in rough waterless country. This is a working outing that will provide you with an understanding of the skills necessary for llama packing in the Oregon Outback. See our llama school pages for details. We also pack gear for you on a contract basis. According to your specifications, we haul your gear from one location to another. Cost for this service varies depending on your needs. Base rates are $500 per day which provides you with a wrangler and four llamas. Additional llamas are available at $55 per day. There is also a transportation cost of $.75 per mile from our ranch to your starting point for up to eight llamas. We do not rent llamas. 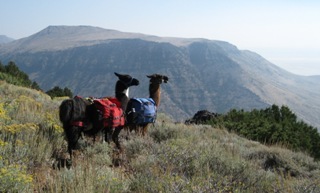 Burns Llama Trailblazers offers backpacker/hiker guide service and support. Based on your interests and needs, we design a trip especially for you. We then provide a guide and wrangler who show you the way and transport your gear. We assign a llama to each party member and encourage you to have as much llama contact as you desire. We will teach you how to safely load, lead, and work with your llama. We do not provide catering services or gear. These are working trips for all of us. You will be expected to set up your camp and manage your own gear, including loading it into the provided panniers. For information on places we enjoy visiting see the SE Oregon Llama Packing section of this website. We invite your queries. As part of our ongoing efforts to support the llama packing community, we offer our services as Pack Llama Trial Association (PLTA) course certifiers. Not only will we come to your site and certify your trial, we set up basic trails at your location for you. We are happy to mentor you through the entire process of setting up and hosting a trial. We have many years experience with pack trials and find them a very useful way to evaluate a llama's ability to perform. They can be a lot of fun too. The only reimbursement we ask for is that you cover the cost of our travel expenses.